Size Choose an option4" x 4" x 2"6" x 6" x 2"8" x 8" x 2"
African Mahogany Bowl Blanks are 6 inches wide by 6 inches long and 2 inches thick. 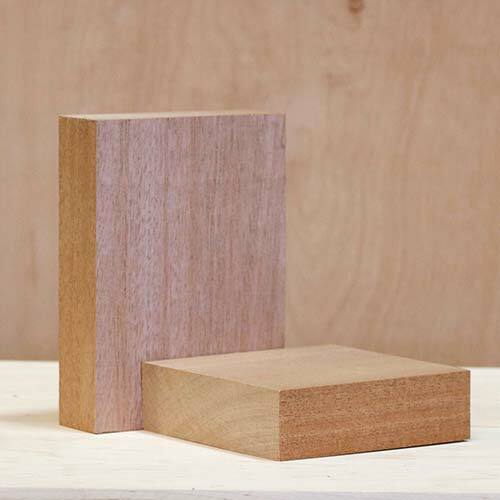 Working with African Mahogany is generally easy with hand tools. Interlocked grain can cause woolliness and tearing when planing. There is also some blunting effect on cutters. It turns and sands well and stains and polishes very well. African Mahogany Bowl Blanks are a light pinkish brown and darkens to a deep reddish color. The heartwood is creamy white to yellowish and the sapwood is not always easily distinguishable. Texture can vary but is usually coarse with a high golden luster. * Carving and Turning Blanks are sawn to +/- ¼” of size listed. These African Mahogany Bowl Blanks are intended for turning on a lathe. They may not be perfectly square and could vary slightly in length and width. If you have specific requirements please contact us or place instructions in the order notes box at checkout.